Nicolas Sarkozy dismisses it as an election campaign “stink bomb” concocted by his opponents. The leftwing newspaper Libération sees it more seriously, portraying the French president on its front page at the weekend sitting on a real bomb with the fuse burning down. “It” is the Bettencourt Affair, a tangled tale even by French standards of the management of the €15bn fortune of Liliane Bettencourt, the frail 89-year-old heiress to the L’Oréal cosmetics empire. Nicolas Sarkozy faces new questions in Bettencourt saga. Investigator reportedly has new evidence to suggest president’s 2007 campaign might have received €800,000 in illegal funding: here. Did Sarkozy meet with billionaire illegal backer ahead of his election as president? Read more here. 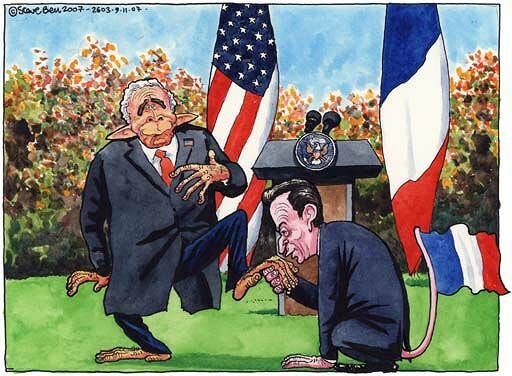 Sarkozy said he was not surprised by the resurgence of the illegal funding claims, adding that in the run-up to an election a few “stink bombs” were always thrown. This drew outrage from Socialist candidate Francois Hollande’s camp. “To say that these are stink bombs is an insult to the justicial system,” said Jean-Marc Ayrault, a top Hollande advisor and leader of the Socialist parliamentary group. Green candidate and former prosecutor Eva Joly last week called for Sarkozy to “give up his immunity (as head of state) and go and explain himself”. Investigating magistrate Jean-Michel Gentil has cited two dubious withdrawals of 400,000 euros each from Swiss bank accounts by an intermediary to Bettencourt’s close aide Patrice de Maistre. On March 23 Gentil, charged de Maistre with several alleged crimes and ordered him detained. The first withdrawal was made on February 5, 2007, two days before a meeting between de Maistre and Eric Woerth, who was at the time treasurer of Sarkozy’s first successful campaign. Woerth later became labour minister but resigned in 2010 as the campaign financing probe gathered pace. In 2011 police carried out searches of his home and of the ruling UMP party‘s office in connection with the case. Bettencourt’s accountant, Claire Thibout, has testified to having been asked a number of times in 2007 to provide batches of 150,000 euros to Woerth. The second questionable withdrawal was made on April 26, 2007 — four days after the first round of the presidential election and over a week ahead of the second round on May 6 that Sarkozy went on to win. 21 September 2017: Liliane Bettencourt dies. There Is Nothing More Anti-Capitalist Than “the People First”. L’Humanite Staff, l’Humanite in France: “For l’Humanite Dimanche, Jean-Luc Melenchon explains the meaning of the citizens’ revolution, specifies the first measures that the government of the Front de gauche will place on the workbench once in power, and describes the steps to be taken in order to impose these measures on the French and European oligarchy”: here. French Left Front candidate holds presidential election rally in Marseille: here. French Left Front in 2014: here. This entry was posted in Crime, Economic, social, trade union, etc., Politics and tagged Bettencourt, France, Sarkozy by petrel41. Bookmark the permalink. Je suis vraiment décue.J’ai elu François Hollande comme président car je croyais au changement tel qu’il était annoncé et à d’une équipe gouvernementale irréprochable. Comme je suis déçue de voir que François Hollande va choisir en tant que premier ministre Jean Marc Ayrault, qui est tout sauf irréprochable. Il a vraiment était l’objet d’une condamnation à 6 mois de prison pour acte de favoritisme. Grande déception !!!. According to Google search http://www.google.com/search?hl=en&gl=us&tbm=nws&q=Jean+Marc+Ayrault&oq=Jean+Marc+Ayrault&aq=f&aqi=d2&aql=&gs_l=news-cc.3..43j43i400.5998.5998.0.6587.1.1.0.0.0.0.61.61.1.1.0…0.0. it is not certain yet who will become prime minister, Jean Marc Ayrault just being one of the names named in the media. Un immense merci concernant Sarkozy’s Bettencourt scandal | Dear Kitty. Some blog qui malgré un thème vu continuellement arrive très simplement à se démarquer.